On June 6th, I held my annual Open House to launch the new catalog. Everyone had a great time with the Make-n-Takes. 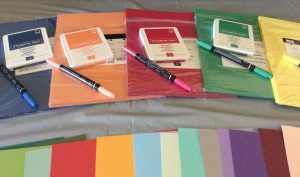 Each one made a note card using the new in-color card stock 24 sheets for $7.00 and envelope to match using the new envelope paper 20 sheets of 12 x 12 for $6.00. You can get the envelope paper either in neutrals or in color. And of course they were using the new in-color ink pads to do their stamping. Prizes were given from periodic drawings and the eats weren’t too bad either…Each attendee received their FREE catalog and if you were not able to attend and want your FREE catalog, just leave me a message and I will definitely get the ball rolling on your request. And the Bow makers. To make the two larger size bows you will need the Gift Bow Die Cut #129977 $33.00 that fits into the Big Shot #113439 $110.00. And the small bow is made with the Bow Builder Punch #137414 $18.00 Notice the little bow on card above. Another great product is the new Gift Bag Punch Board #135862 $20.00. This is awesome for making favors and paper crafting items for craft fairs or to package a special gift. Here is a bag I made with it. I should have done a little decorating, but I believe I missed the boat on that one. If you are interested in learning more about these products or wish to purchase any of them, there are four (4) ways to get in touch with me! The drawing was held for the March Blog Candy. I have sent an email to the winner and am waiting for an address so I can mail the 6 piece Stamp Set. Thanks to all who entered the drawing for March. Be sure to come back in April to see what is happening. Following is a picture of the Stamp Set for March.